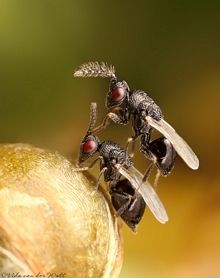 Biology Phytophagous (as seed predators, stem feeders or gallers); or parasitoids of wide range of insects; or inquilines feeding on both the host insect and surrounding plant tissue. Bouček, Z. 1969. On some new or otherwise interesting Torymidae, Ormyridae, Eurytomidae and Pteromalidae (Hym.) mainly from the Mediterranean subregion. Bollettino del Laboratorio di Entomologia Agraria 'Filippo Silvestri', Portici 27: 27-54. Burks, B.D. 1958. A new Bruchophagus from liliaceous plant with a host plant list for the genus (Hymenoptera, Eurytomidae). Proceedings of the Entomological Society of Washington 59: 273-277. Delvare, G. 1988. Revision des Eurytoma (Hym. : Eurytomidae) d'Afrique occidentale decrits par Risbec. Annales de la Société Entomologique de France 24: 117-149. Gates, M.W. 2008. Species revision and generic systematics of World Rileyinae (Hymenoptera: Eurytomidae). University of California Publications in Entomology 127: 1-332. Gates, M. & Delvare, G. 2008. A new species of Eurytoma (Hymenoptera: Eurytomidae) attacking Quadrastichus spp. (Hymenoptera: Eulophidae) galling Erythrina spp. (Fabaceae), with a summary of African Eurytoma biology and species checklist. Zootaxa 1751: 1–24. Lotfalizadeh, H., Delvare, G., & Rasplus, J.-Y. 2007. Phylogenetic analysis of Eurytominae (Chalcidoidea: Eurytomidae) based on morphological characters. Zoological Journal of the Linnaean Society, 151, 441–510. Rasplus, J.-Y. 1988, Nouvelles espèces d'Eurytomidae principalement parasites de coléoptères séminivores de légumineuses en Côte d'Ivoire (Lamto) (Hymenoptera Chalcidoidea). Bollettino di Zoologia Agraria e Bachicoltura, Milano (II) 20: 89-114. Banner photograph © Vida van der Walt; other photograph © Hamish Robertson (Iziko Museums).